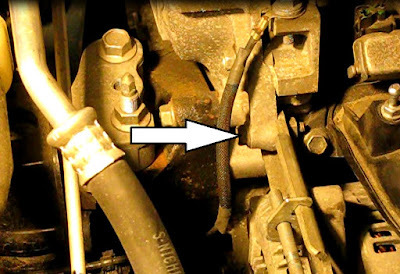 1) Disconnect the battery with a 10mm wrench or socket and ratchet..
3) Unplug the lower control wire by depressing a keeper on the right side. Unwire the alternator. Use a small flat blade screwdriver to pry off the protective cover and slide it down the large B+ wire. Now use a 12mm socket to remove the nut. Remove the wire from the stud. 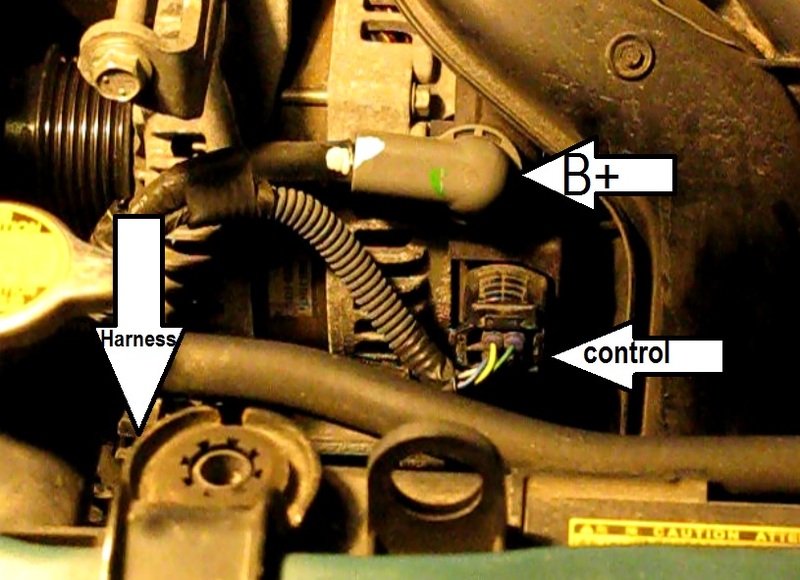 Disconnect the wiring harness from the bracket to the left of the alternator. 3) Remove the upper 12mm mounting bolt. 4) Remove the lower alternator 14mm pivot bolt. 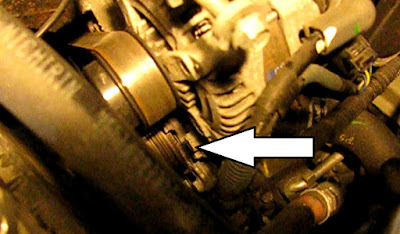 5) Remove the adjustment bracket above the alternator. This is a 12mm bolt. It is in the way of the removal of the alternator. 6) Remove the alternator. Use a large screwdriver under the alternator to pry it off the pivot arms. It will be removed up and out of the engine compartment. 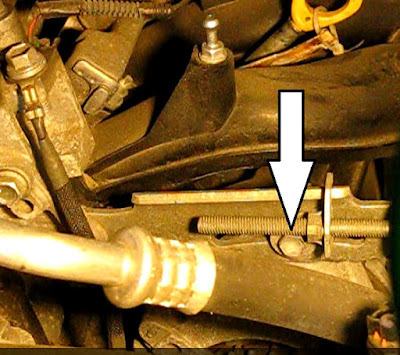 1) Slip the alternator through the top of the compartment and between the two pivot arms. It may be helpful to put a bit of grease on the mating surfaces of the arms as an aid as this is a tight fit. 2) Turn in the long 14mm pivot bolt hand tight only. 3) Install the adjustment bracket with the 12 mm bolt hand tight only. 4) Install the upper 12mm mounting bolt through the adjuster and into the alternator, again hand tight only. 5) Wire the alternator back up. 6) Install the belt in place. Refer to separate blog for that if needed. 7) Set the tension on the belt with the adjuster. Refer to measurement or guide used earlier or the rule of thumb: 1/2" of defection at the middle of the longest run of the belt. 8) Tighten all bolts to final torque. 10) Re-mount the engine cover. See, this is one of the many reasons why I love JDM Cars - repairing them is a cinch! Well, most of the time anyway... But you wouldn't believe how much trouble it was to replace the alternator in my Cadillac Deville compared to this. Thank you for this info! So helpful! Changed alternator on Scion XD 2010. Couple of differences. Cannot remove the adjuster arm - the mounting bolts are too close- just had to hold it out of the way. Wish I had unlocked my doors before disconnecting the battery. Had to remove the bracket the harness attaches to to remove alternator and install on new one.